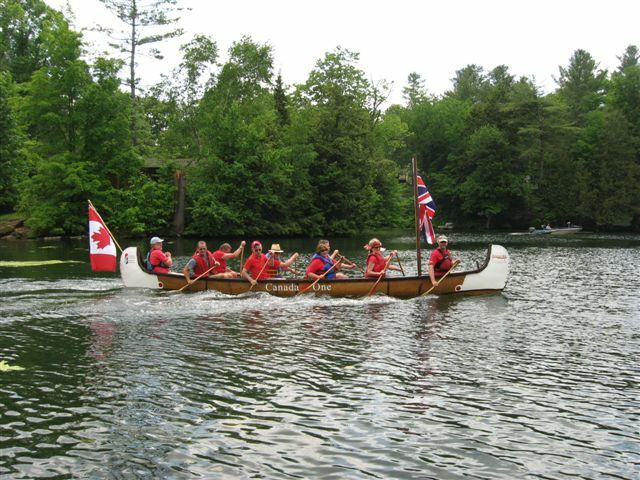 The Canadian Canoe Museum is proud to be participating in the Thames Jubilee Pageant, which will take place on Sunday, June 3rd in celebration of the Diamond Jubilee of Her Majesty Queen Elizabeth II. 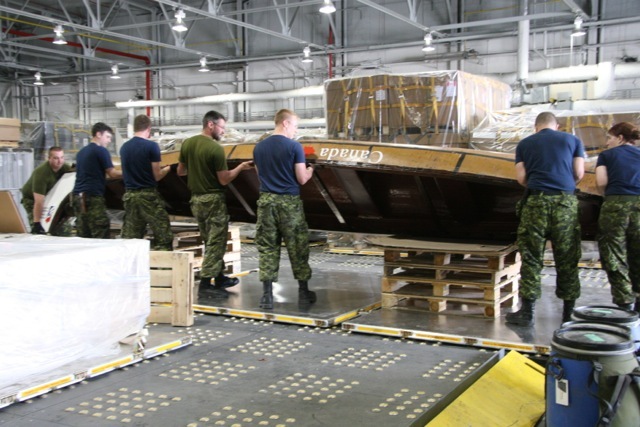 More than 1000 vessels from many nations and in a wide variety of shapes and sizes are slated to take part in a massive flotilla on the Thames River. 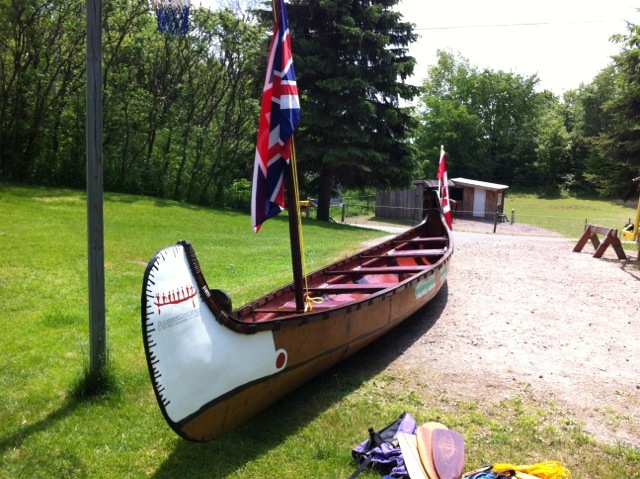 The Museum’s crew of paddlers is being led by Executive Director James Raffan, who has been reporting in from the field during the preparations leading up to the canoe’s departure for the UK late last week. Here is his first report in his own words. 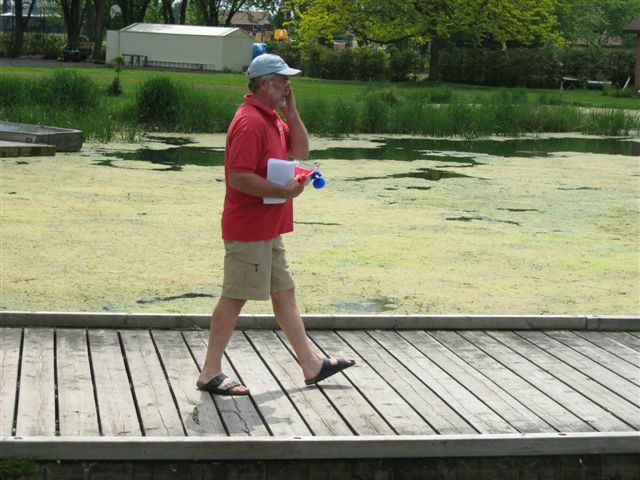 Preparations for the trip were also reported on by The Ottawa Citizen and Brockville, Ontario’s The Recorder and Times. 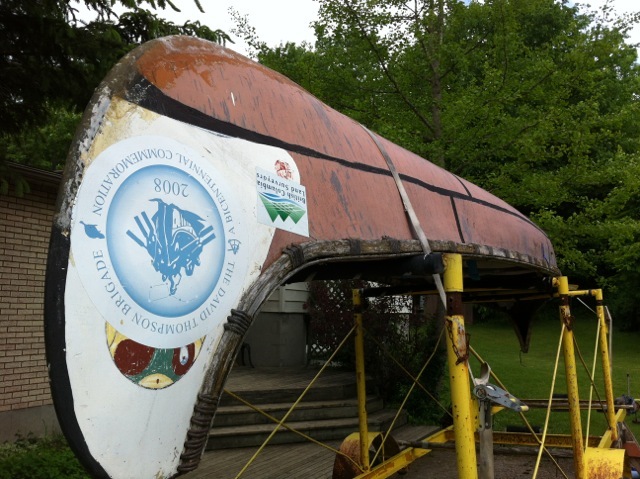 The Museum crew is paddling a well-travelled 26′ replica North Canoe on loan from Paddle Canada, the country’s national paddlesports organization.This is what the canoe looked like “before” refit and renovation in Seeley’s Bay around Mother’s Day. This would be the “after picture” just before her Christening Voyage” on the Rideau in Seeley’s Bay on Thursday, May 25th. We flew the union jack upside down (how embarrassing for the son of a Surgeon Lieutenant in the Royal Navy!!!) 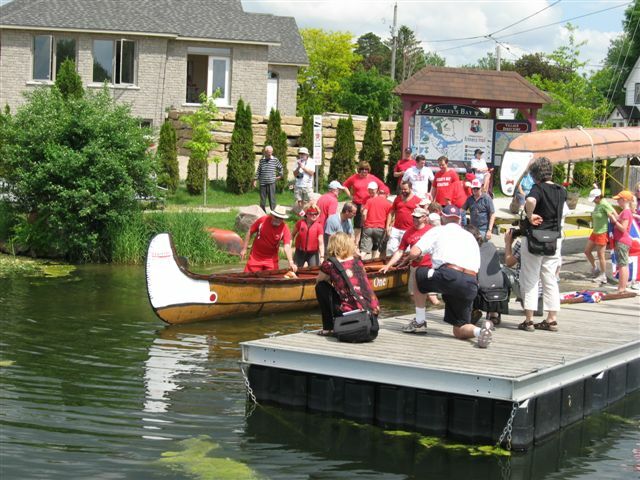 but the christening voyage in Seeley’s Bay harbor (just near our brand new canoe dock and paddler’s welcome station that was officially opened on May two-four weekend) was a great success. The crowning glory in the day was the North Leeds Volunteer Fire Department’s boat which fired up one of its portable pumps and sent a rainbow geyser of water over the harbor (simulating the Thames on Pageant Day). 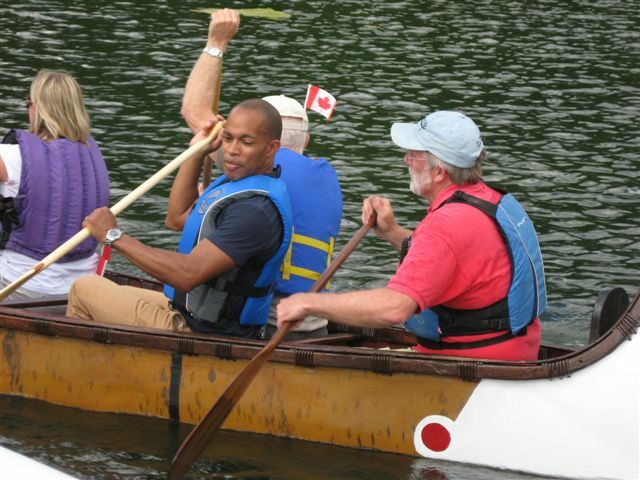 Reporter Ron Charles from The National interviewed James in the canoe. 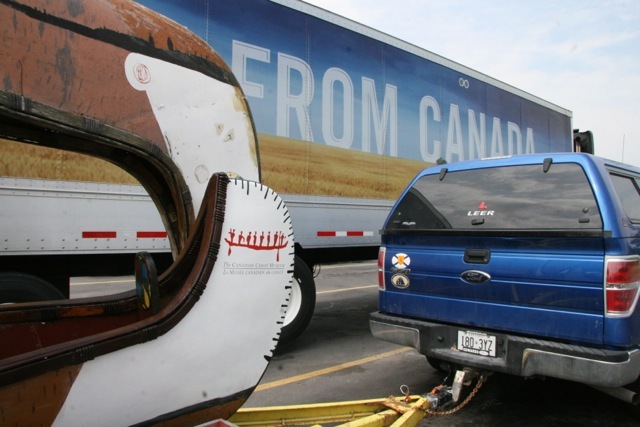 International logistics on the fly … while keeping in touch with the Home Office at the Canadian Canoe Museum in Peterborough. 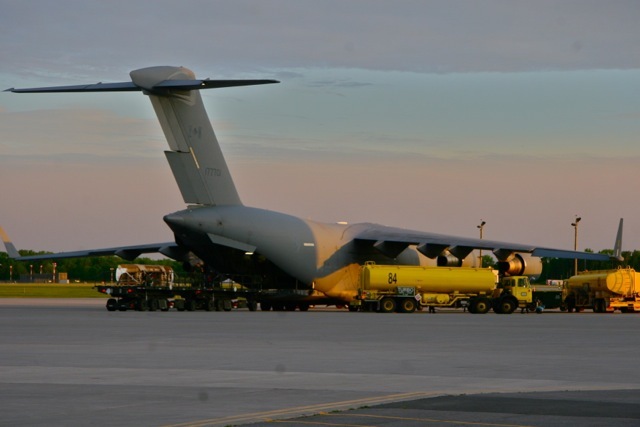 On the morning of May 25th we took Canada One to Trenton. After coverage on The National the night before, people along the highway honked and waved. 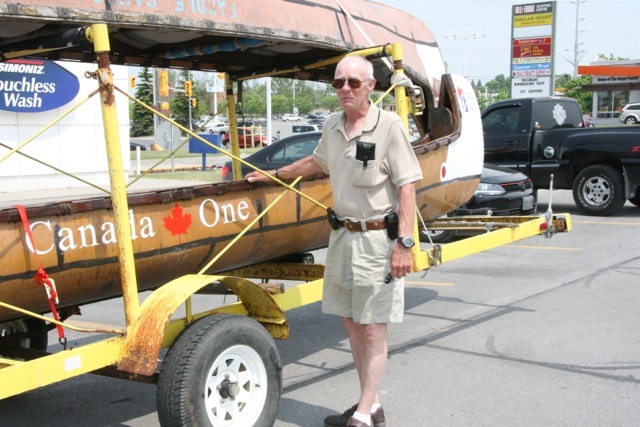 When I went in to Canadian Tire in Belleville I found Gail with a guy who was so excited about seeing Canada One (having seen it on the news the night before) that he wanted his picture taken with the boat. 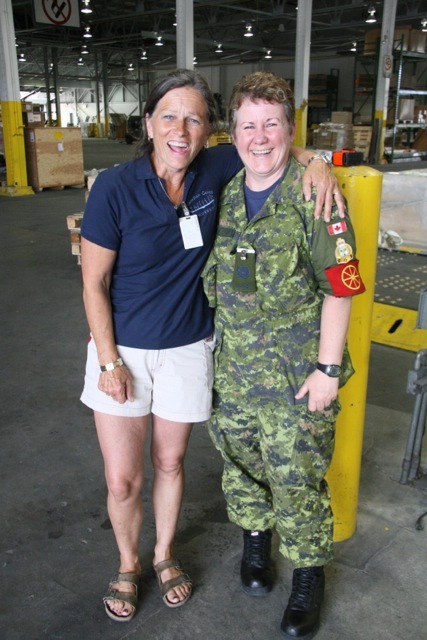 My wife Gail with Master Warrant Officer Luanne MacKinney, who was our contact person at 8 Wing in Trenton. Of course, in five minutes they realize they know a bunch of common people and they’re best friends! Small world. 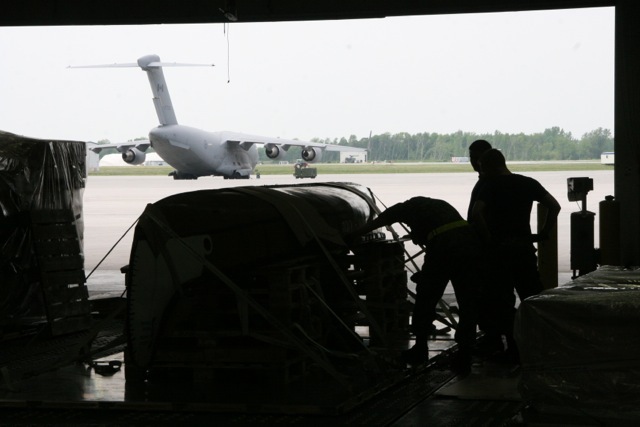 Warrant Officer Trevor Ambroziak (4th from left) and his team of “air techs” from 2 Air Movement Squadron at 8 Wing did a fabulous job “palletizing” Canada One, taking very special care of precious cargo, which is what they do. 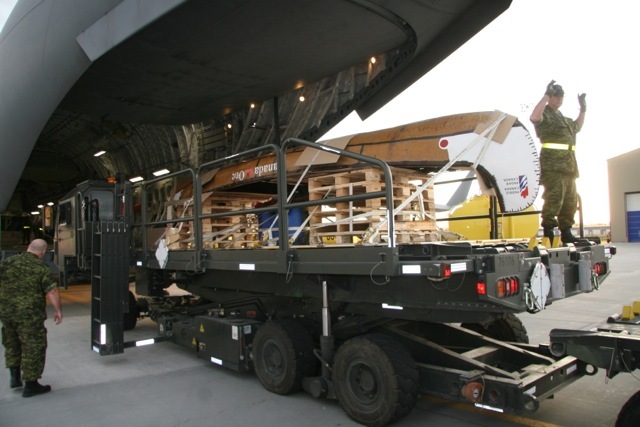 There she is getting prepared for loading onto a massive Globe Master cargo plane that would drop us off in England on scheduled flight to Estonia. 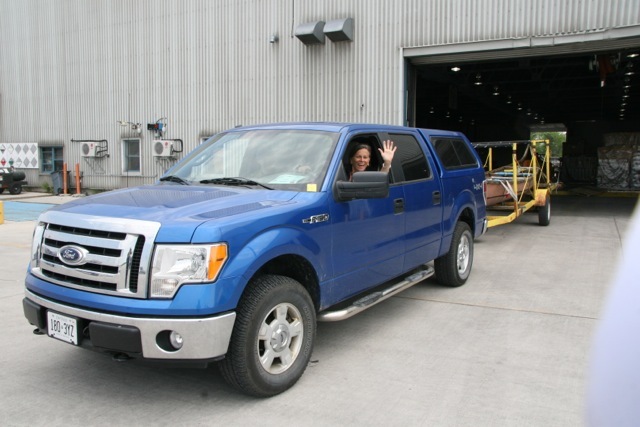 The family teamster, Gail Simmons, takes the truck and trailer home to Seeley’s Bay. Loading the canoe on early on Saturday, May 26th. 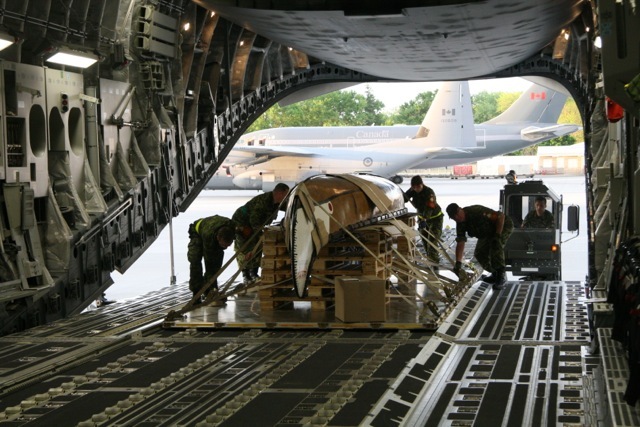 They are a shy and retiring bunch, the members of 429 Squadron who do the heavy lifting for the Canadian Forces. 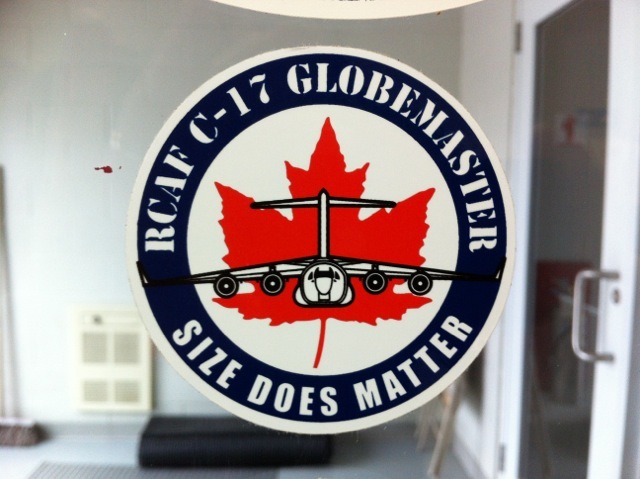 Canada One was a big and cumbersome load but nothing like some of the tanks and other heavy equipment that the Globe Master can carry. 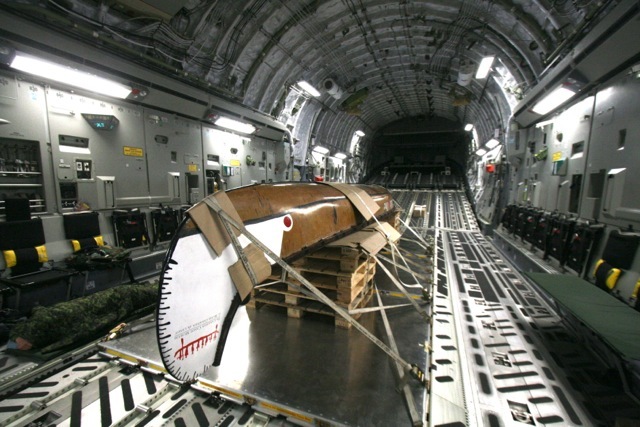 Once “palletized” the canoe and all our gear could be just rolled into the fuselage of the plane. Canada One secured for take-off. 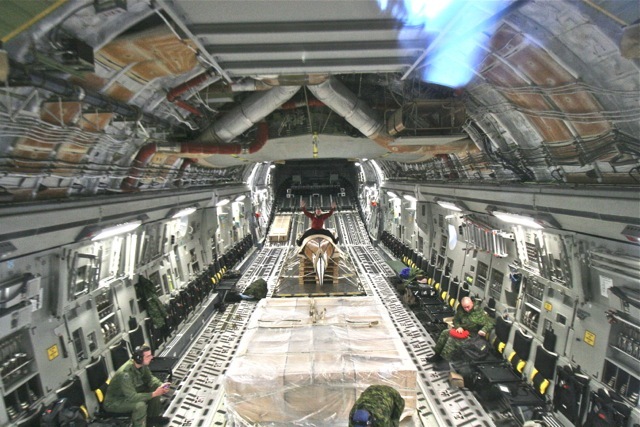 No telling what a guy might do with time on his hands at 35,000′ over the North Atlantic. 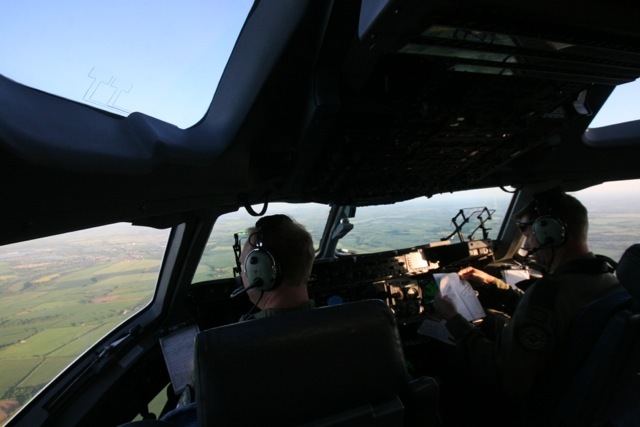 Pilot Captain Kevin Mulkins (left) and First Officer Major Bill Church (right) talk to Scottish traffic control as we descend from our arc over the North Atlantic en route to Brize Norton Air Base, west of Oxford, UK. A safe journey. 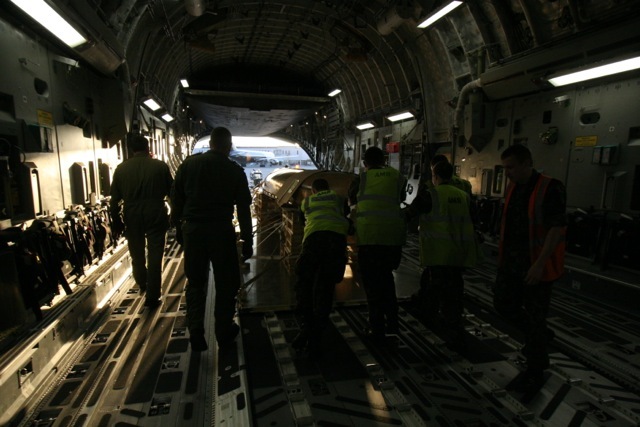 Unloading at Brize Norton in the low light of evening on Saturday.